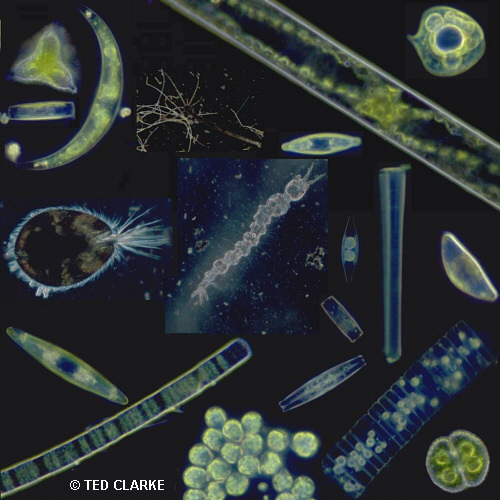 Ted Clarke has kindly sent in this attractive montage of freshwater life photographed using dark-field illumination. Ted remarks that the component images used a typical exposure of 1/30 second on 200 ISO Ektachrome for the small organisms photographed with the 40X (N.A. 0.65) objective. The hydra was photographed with a 1X drawtube mounted macro lens and cropped from a 10 mm field diameter. The larva and ostracod were photographed with a 5X objective. Ted has designed and home built a universal student microscope based on a Biolam stand. The lighting uses a fiber optic light guide and the field lens is an old SLR lens. The condenser with this illumination system is capable of darkfield with the 90X 1.25 NA oil immersion objective. The home-made spider mounted dark-field stops go in a slot at the end of the light guide where the aperture diaphragm is also located. A brief summary of the microscope design with illustration is provided in this supplementary page. The microscope design is discussed in the article: Clarke, T. M. "Building an Affordable Universal Student Microscope"; THE MICROSCOPE 2000, 48, 19-39. Comments to the author Comments to the author sent via our contacts page quoting page url plus : ('tclarke','')">Ted Clarke are welcomed. Some macroscopic and microscopic freshwater life of Fish Lake, Lagrange County, Indiana, USA. Photographed by Ted Clarke. The montage includes a hydra, ostracod and algae (e.g. filamentous, desmids, diatoms). How many can you identify? The author has offered a larger 2048x2048 pixel version for readers to download if they wish, e.g. to print out or for private use as a screensaver. Click on the image above to download the larger version (598 kbytes). For other uses of the image, please contact the author, Ted Clarke e-mail Comments to the author sent via our contacts page quoting page url plus : ('tclarke','')">tclarke@kuntrynet.com.